This is a copy of a session I did for a recent event called, "Elemental" put on by the Pathfinders Fellowship. The second church I co-planted called Cypher Church, is designed for the “outsiders”—people who would never connect with a contemporary church on their own. That’s not because they have an issue with faith, but because they are foreign to the language in the church and as such any message is lost in translation. The outsiders are the kinds of people Jesus would hang out with: the misfits, the prostitutes, the lepers, the homeless, the foreigners…. It’s a community that’s in stark contrast to many churches that have a problem of “sameness”. Communities that look, earn, talk, and believe in the same things. This kind of church struggles to connect with people who don’t look like the majority (assuming they even care to connect). As Canadian culture becomes post-Christian, (a place where the church no longer has inherited cultural power), and as immigration increases ethnic populations, the church will continue declining. Are there ways to reverse decline and survive and thrive on the margins? Cypher Church launched by asking critical questions. We were interested creating community that would connect with people who would otherwise never fit into contemporary church culture. Our idea is we can achieve this goal by creating a strong culture of discipleship that seeks the fullness of life rather than merely shifting the package of a service. So far, by stripping away many tired church traditions we’ve managed to create a community where about 75% are the nones and the dones. Who are the nones and dones? In Canada the fastest growing religious segment is no religion at all. The “nones” are those who would check the box, “no religious affiliation”. They are about 25% of the total population, growing by about 1 percentage point a year. The number of millennials who are nones is higher at about 1/3. In one generation, half of Canadians will be nones. Similarly, the “dones” are people who have some form of religious memory; they grew up in a religious setting, maybe went to a service for the key events like Christmas and Easter, but today are not practitioners. The dones are over 50% of the population. That leaves the remainder, under 20% of the population, that attend a service at least once a month. This is in stark contrast from the 1950s where weekly attendance was just under 70% (higher than American church attendance). In light of the demographic shift, today many churches live in a culture of false marginalization. We look at all the “non churchgoers” and assume the worst—they must be atheists bent on destroying church culture. However, that’s not accurate. Only a tiny fraction, between 5-8% would consider themselves atheists. That suggests there really is no adversary. The church on the margins is not necessarily marginalized. Rather, it’s been pushed aside by mainstream culture because it can no longer communicate its message in a way the outside world can connect with. We may also think being on the margins is bad news for the church, but I consider today’s culture a great opportunity. Here’s why. From what I’ve seen, claiming no religious affiliation does not mean antagonistic to the possibility of faith. Nones are largely neutral and have no opinion about faith. Dones are the same, yet they also carry some religious memory. 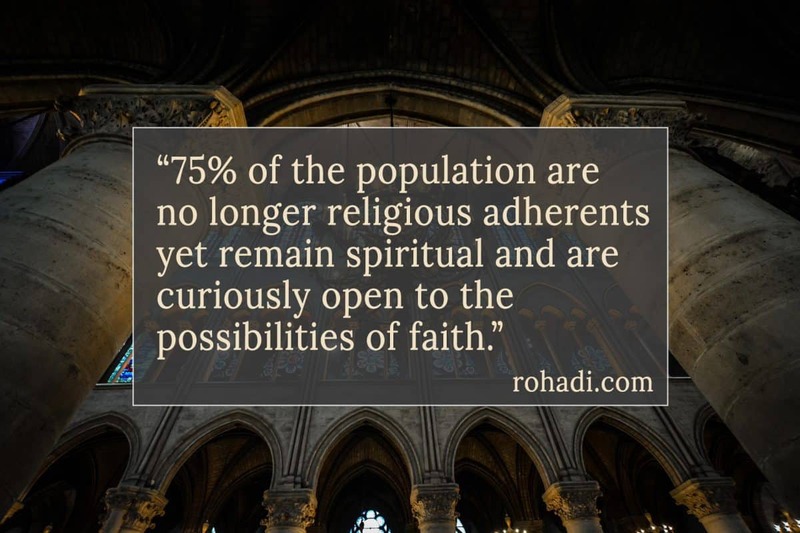 More importantly, the nones and dones are not against ideas of spirituality. They are “spiritual but not religious”, and it’s this majority segment in Canadian culture that the church lacks competency to connect with. It’s also where we have our greatest opportunity. Around 75% of Canadians do not attend a regular religious service yet remain spiritual. This sounds like a renewed opportunity for the church. Today’s Canada has emerged without a participating church because we are used to being the centre of attention. My grandma’s church just assumed people would come to them looking for answers to life’s problems. Christendom created a posture where the church could sit back and wait for the world to come to it. It’s a posture that hasn’t fundamentally changed with culture. The core activities around a Sunday service are the same although the delivery may be different. Similarly, the core language in our kingdom expressions hasn’t shifted much either. Case in point, is your church able to tell the story of Jesus in a language that outsiders can grasp? This idea of mission (search for topics on the “missional church”) is based in the building of the church found in Ephesians 4. Most often mission in the church is something done “out there” in a far away land by professional missionaries. At home it amounts to “outreach” programs for a season. What if we fundamentally altered the way we approached mission? What if we re-valued the mission right here at home? God is a missionary God seeking to reconcile all of creation. We are invited to participate in this unfolding kingdom in the here and now. Mission as the lens through which we filter the function of the church is better suited to release congregations to be present in our neighbourhoods and cities. It helps raise the gifts of the people in the church to live out mission in their own context. My grandma walked to one of the three parish churches in her neighbourhood. We need to reclaim the parish mentality without the inherited cultural power and privilege that Christendom afforded. Commuter churches devalue place. We have to revalue the places we live. Proximity counts big because at the heart of the Christian faith is the incarnation—God with us in touch, feel, smell, all things you obtain through presence. We need to learn to serve the needs and dreams of the people we live around. Finding ways to revalue our immediate neighbourhoods, which includes loving thy neighbour in action and deed, are important attributes of the church in post-Christendom. Pragmatically, we also all don’t spend our entire lives in our neighbourhoods. That’s why in addition to place we must value presence. Everywhere we go has kingdom potential at work, and those spaces, and the people in them, count. Here’s a suggestion for leaders. Change is hard, even when it’s necessary. Gaining much needed early momentum can mean the difference between a community adopting a new vision, or failure. One strategy to accomplish this is to look for the bright spots Coming alongside already unfolding activities are easy wins. It’s the activities and people already on mission in their places or spaces. These people don’t ask for permission to live out mission, they just do it. Find these people, champion them, resource them, and learn from them. It will also inspire others to open their eyes and ears to the kingdom at work in their world when they realize anybody can live out mission in their unique voice. The church in Christendom had inherited authority. Pastoral credentials gave automatic input into peoples lives. In Cypher Church, I have no inherited authority by designation. I don’t have a say in somebody’s life, what they do, what they believe, simply because I’m a pastor. The moniker is almost meaningless. What I have to rely on instead is the authority I’ve earned through relationships. Once there’s relational trust, then there’s opportunity to speak into someone’s life. Recently, I was at a lecture featuring a prominent missiologist who was presenting in an old mainline congregation. I was the youngest person in attendance by 30-40 years. He was broaching the topic of re-orienting the church to adopt a lens of mission. It was a heartfelt admission and a good question. Why have the adult children given up the church? The speaker replied, the continued witness of the parents to their children still matters. Hold true. One day, perhaps, they’ll return. I understood the sentiment, but I disagree with the hope. When the older man was lamenting his kids who don’t go to church anymore, he wanted a return to his past culture. It’s no wonder his kids aren’t interested in that life, it’s dad’s life, not theirs. Every generation wants to be inspired towards something that works in their lives today. We don’t want to be called back to reclaim someone else’s heritage that had limited benefits. When Christians talk about a revival for the church I ask, “a revival to what?” Christendom in this country benefited a specific kind of church: white Protestants and white Catholic churches had the power. I’m not interested in a return of any church to the centre of cultural power and privilege. The identity of the church will do better at the margins subverting culture with the way of Jesus. The fact is we will never go back. Canada has changed forever. The church is now on the margins yet also sits in a moment of great potential and opportunity. We are in a time where we can decide to thrive on the margins and move forward as co-creators of culture as a church living out our gospel character to new generations. It will mean changing the way we tell God’s story of rescue and redemption. A story that totally and completely answers the longings that every human has, but a story that the traditional church struggles to connect with the outsiders.